Sweet Sarah. Darling princess of the Lord. You have no idea what is coming do you? For years your husband has come to you with joy and hope in his eyes. He shares excitedly about his encounters with God Almighty. You listen, you nod at the appropriate times, you even force a smile; but you can’t seem to muster that same hope, that same joy. Would you believe me if I told you that all of that is about to change? 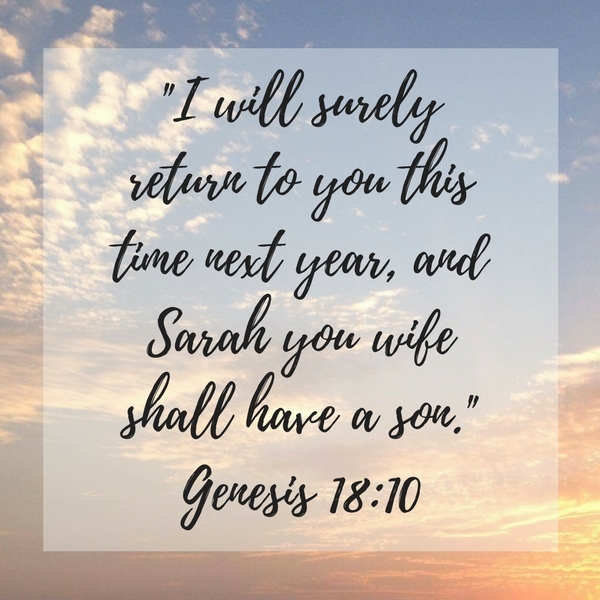 Thirteen years have passed since Sarah’s maidservant Hagar gave Abraham a child–the very thing for which Sarah had longed for nearly her entire life. However, the hope of that dream coming true is lost now. She’s old and her husband even older. Plus, God’s promise came true. Abraham had a son, Ishmael. Apparently God didn’t need her to give Abraham a son. Perhaps He didn’t want her to be a part of His plans. Oh, well. It’s not like there isn’t enough to do around this place. A child would only add to the daily chores. What with sweeping and cooking and everything else on her to-do list, who has time for feeding a hungry belly, changing dirty diapers…loving a beautiful child. This is where we find Sarah as we pick up in chapter 18. She’s in the tent, perhaps preparing a meal or mending something or maybe she’s even found a slice of time to rest her weary bones. Perhaps Abraham hasn’t had the chance to tell her yet about God’s latest message. Or maybe she just doesn’t believe it. Through the open flap of the tent Sarah hears voices, muffled as if they are a short distance away. She peaks out and sees her husband rising up from the dust in front of three men, turning, and running toward her. “Sarah, quick,” he says, slightly out of breath, “make some bread! I’m going to get the calf!” And just as quickly as he came, he turns and heads for the livestock grazing a little ways off. With a sigh Sarah pulls out her mixing bowl, her flour and oil, and sets to work. Bread and a calf? All of this for whom? She peaks out of the tent again and sees the three men sitting in the shade of that familiar tree just outside. She doesn’t recognize them, so she turns her attention back to baking. A meal is taken out to the men a little while later and they eat it. Abraham even sends a servant out with a basin and some water to clean the feet of the men. Sarah keeps to herself in the tent. Abraham has his guests well taken care of. Her job is done. Now it’s time to move on to the next thing. Always the next thing. She sets a pot on to boil. Best to do the dishes now before the dough hardens on her mixing bowl. She is hard at work moving hot water around the bowl with a damp cloth when the mention of her name causes her ears to perk up. “Where is Sarah your wife?” The voice wasn’t that of her husband. Sarah moves closer toward the opening of the tent, but keeps out of sight. How did these strangers know about her? How did they know her name? Especially that name? She had been Sarai for so many years. And she had only been called Sarah for a few days, maybe weeks, a hand full of months at the most. Absently her hand swirls her cloth through the warm water as she listens more intently to the conversation going on outside. The words of the strange men bounce around in Sarah’s head, trying to find a place to land. They don’t make sense. This must be a dream. As their words finally settle in, the only response she has is that of humor and doubt. She laughs. What a preposterous statement! Are these men blind? Can they not tell that Abraham is an old man, and that she herself is well past the age of having children. No, it couldn’t be. “After I am so worn out, and my lord is old, shall I have that pleasure?” (Genesis 18:12) She spoke the words aloud, just loud enough she thought that only she could hear them. But apparently sound travels well in the heat of the day, for the men had heard her too. Astonished, Sarah steps into the doorway, trembling as she looks out at these strangers. “I did not laugh,” she told them. Her voice faltered and her hands trembled. Something told her that this wasn’t a normal encounter.